Mae C. Jemison is principal of 100 Year Starship, a collaborative effort to make human travel beyond the solar system a reality within a century. She blasted into orbit aboard the NASA shuttle Endeavour on September 12, 1992, as the first woman of color to go into space. The flight was just one of a series of accomplishments for this dynamic woman, who founded and served as president of two technology companies. 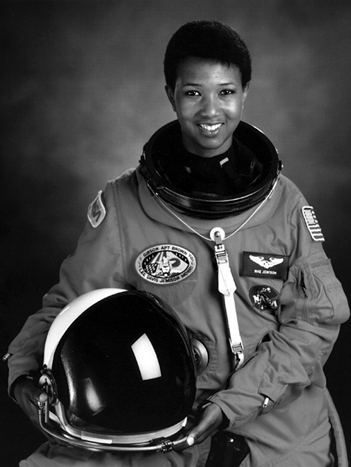 Prior to becoming a NASA astronaut, Dr. Jemison practiced medicine in Los Angeles and was the Area Peace Corps medical officer for Sierra Leone and Liberia in West Africa. After NASA, she was a professor of environmental studies at Dartmouth College and an A.D. White Professor-at-Large at Cornell University. She founded the non-profit Dorothy Jemison Foundation for Excellence, which developed and has hosted, among other initiatives, The Earth We Share™ (TEWS) since 1994, an annual international science camp where students, ages twelve to sixteen, work together to solve current global dilemmas. In 2009 she joined President Barack Obama in a stargazing event at the White House and participated with First Lady Michelle Obama in a National Women’s History Month program to encourage young women in high school to pursue careers and their dreams. Dr. Jemison is a member of the National Academy of Medicine. She has garnered many of the nation’s highest national, academic, and institutional honors for her public service as an astronaut, scientist, healthcare provider, and educator. Born in Decatur, Alabama, and raised in Chicago, Dr. Jemison earned a B.S. degree in chemical engineering, fulfilled the requirements for an A.B. in African and Afro-American Studies from Stanford University, and received her M.D. from Cornell University.